I’m pretty easy on the kids when it comes to screen time, but when Mitch starts squishing his food into cubes before he eats it, I know we need a Minecraft detox. 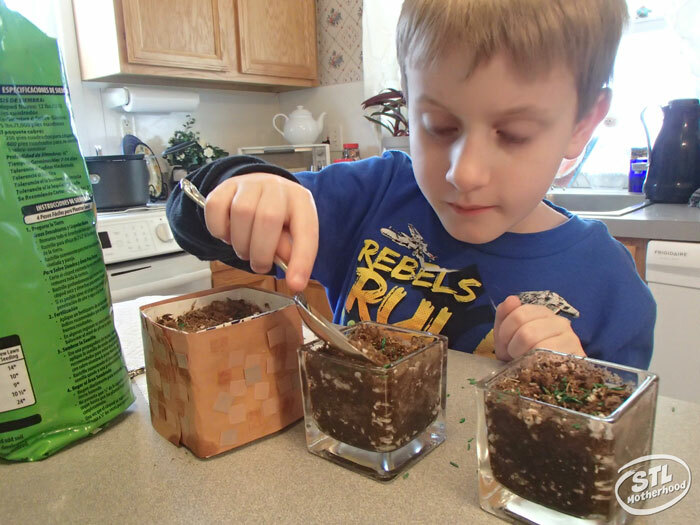 Here’s a simple and fun project you can do anytime–but spring is the best! You just need some dirt, a Minecraft action figure and a dairy carton. 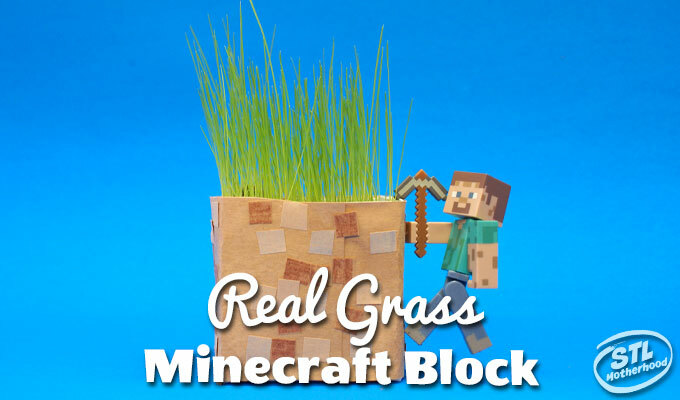 Now let’s make some REAL Minecraft grass blocks! 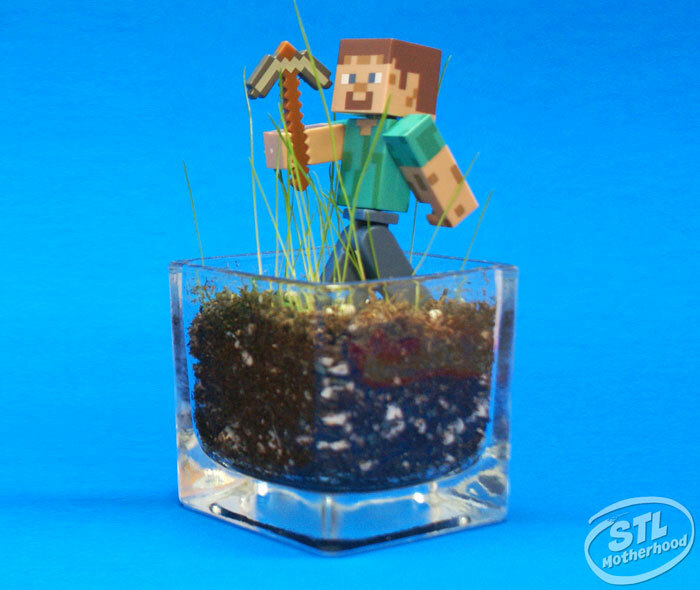 Mitch and I ended up making three different types of “real” Minecraft grass blocks for our Steve action figure. Two of them have actual grass you can plant and grow–and they look pretty cute on our window sill. The 3rd is just paper, so it can be played with. Mitch had fun making all of these! 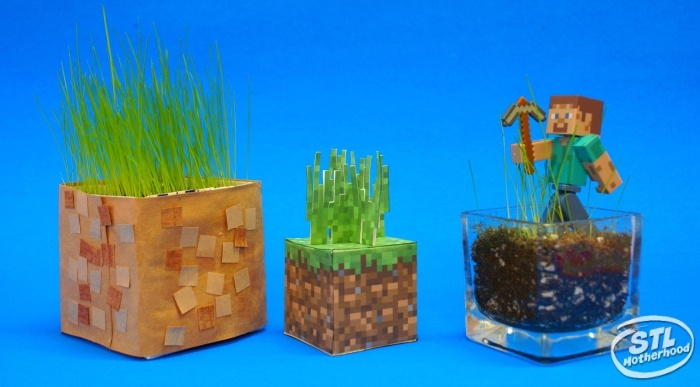 The DIY planter of the real grass block is made from a half and half container, but any small cardboard dairy container would work. Small paper milk containers are waterproof–making them perfect for holding plants. I cut the top of the container off to make it into a square, then let Mitch wrap it in brown construction paper and stick it on with a glue stick. 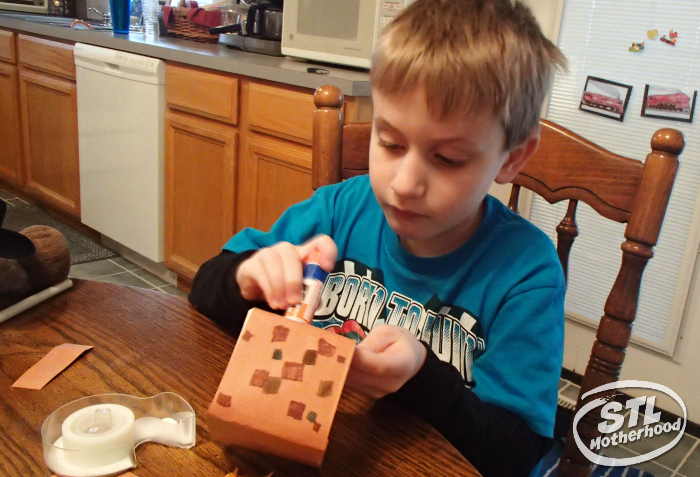 Mitch then used a marker to decorate the block with brown and grey “pixels” for that “Minecraft” look. It’s not necessary to cover the whole thing, just a few here and there will give it the right effect. Once the glue is dry it’s ready to use just like any other pot. The smaller glass block doesn’t need any crafting–it’s a square candle handle holder we picked up from Micheal’s. I love it when I can find a craft for Mitch to make but actually LOOKS nice sitting out in public. Does that make me a bad mom? Hope not! Both of the real grass blocks were filled with potting soil and sprinkled with grass seed, then dusted with more soil. After about 10 days of sun and water, we had a decent amount of grass to photograph. The third block is for play and is made from paper. 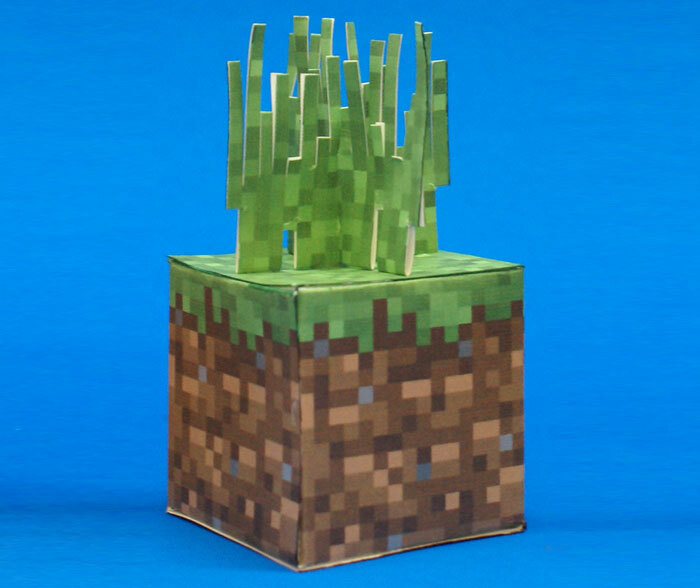 I got the grass block from Pixel PaperCraft and cut the “tall grass” from squares of Minecraft green copied from the top of a grass block. I made two double-sided squares and chopped out sections to make it look like blades of grass. Then I cut a slit from the bottom up in one square and the top down in the other square so it would stand up on it’s own. I glued it to the top of the paper block to keep it together. 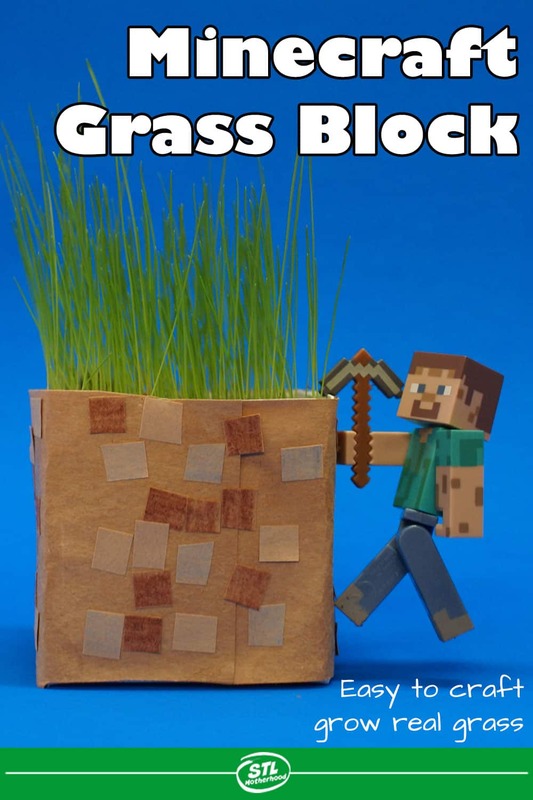 Pixel PaperCraft has a tall grass block you can download, but I liked mine better.